An incredible woman once told me that when her husband, who was undergoing treatment for Chronic Lyme along with a myriad of co-infections, got really down and depressed she would turn on Christian praise music. Even if it is just in the background, it would help lift his spirits and change his mood. This past weekend, after getting some very encouraging news from my LLMD on Thursday, I went through a really rough herx that lasted for days. Admittedly, I threw myself a pity party. I am finally well enough on certain days that I can get out of the house and someone had given me and my boyfriend tickets with incredible seats to the Bama vs. Florida football game. (I apologize in advance to any Gator fans that may be reading this blog). Quick Disclaimer: If you have no interest in college football skip the next few paragraphs...I finally make my point and I will place an asterisk where you should start reading again. 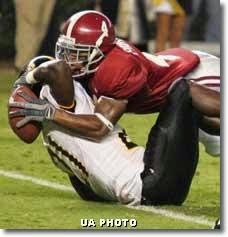 I was a student when Tyrone Prothro, famously known for making one of the most incredible catches in NCAA history (see video of "The Catch"...and picture...can you tell I'm college football obsessed?! ), suffered a career-ending complete fracture of both major bones--tibia and fibula--of his lower left leg in the 2005 Florida game. Sitting in the stadium while watching the majority of the Florida fans cheering and celebrating the injury with the Gator Chomp while our beloved Prothro was carted off the field is a memory that will be seared in my mind forever and created a grudge that may never be forgiven. In all fairness, Bama fans retaliated in a classless way when we beat the Florida Gators and their beloved Tim Tebow in the 2009 SEC Championship game by replacing "Hey Gators!" with "Hey Tebow" in our Rammer Jammer victory chant as he shed, ahem, a few tears on the sideline. I admit to thoroughly enjoying loudly lending my voice to this taunting chant in the Georgia dome that year, but in my defense, I spent my entire college career watching Alabama lose most games in its fall from grace as a historical football powerhouse. So when, as a graduate student, we finally started playing like the Bear himself was smiling down on us from Heaven, I completely lost my composure and enjoyed ever tear that fell from Tebow's Heisman-winning face. On a side note, I now realize that Tim Tebow is an incredible man and I have nothing but respect for him. Seeing a football player openly praise God in this era of dog-fighting and domestic violence in elevators is a breath of fresh air. I wish him all the best in his career as a football commentator and genuinely have enjoyed watching him this season on the SEC Network (didn't he look good in that houndstooth hat when he picked Bama to win last Saturday? But I digress...). So, after receiving good news from my LLMD and having a relatively herx-free treatment week, I was elated that my health is improving and looking forward to finally getting out of the house and going to a a great football game with a strong tradition of rivalry. In the South football games are social affairs--we get dressed up, tailgate in tents or at our favorite bars from college, and see just about everyone we know, including friends I have not seen in years. Having Lyme puts a stop to any form of social life, so between the game and getting to see friends, I was ready to feel "normal" for the first time in as long as I can remember. I had been feeling so relatively well all week that I just knew I would be able to participate in all the fun (in a Lyme-responsible way, but still) without having to use an excessive amount of certain medications to do so. This along with the fact that I had convinced myself my herxing from now on would be hard but manageable led to one of the biggest pity-parties I have thrown myself thus far in this journey through treatment. This was one of those mind-numbing, being tortured from the inside out kind of herxes that just would not quit. I was miserable. I was angry. My anger, for the first time in almost a year, was turned towards God. "WHY!" I screamed over and over again. "Why are you punishing me?" I was so mad at Him for giving me this disease, for all of the things Lyme has stolen from me, for broken relationships due to my health, for the loss of my 20's, for living 28 years with these evil bugs and parasites living inside of me and wreaking havoc on my mind, body, and spirit. In my anger and confusion I even asked my boyfriend what I had done that caused God to punish me so. When I am in my right mind I know the following to be true: I do not believe in a God full of wrath--I believe in a God of love; a God whose Son suffered and died on the cross to forgive our sins. A God of beauty and warmth. A God of creation. A God that is good. A God that heals. And a God that has healed me--mind, body, and soul. But this weekend I had forgotten that God. I was angry with the "punishment" He had given me. Babesiosis, one of my co-infections, is one of the plagues that God sent to the evil Pharaoh. In my Lyme-rage tinted lenses, He had sent this plague to me. To punish me. To torture me. So, looking back to the first sentence...I did not even remember the advice of listening to Christian-based music at the time of this torturous herx, anger, and self-pity. But my sister did send me to a link to a song that was written about a girl fighting Lyme. I listened to it. And listened to it again. And again. I cried as I listened to the words. I cried for the loss of a regular life. I cried for all those suffering from this disease. I cried for all the lives needlessly lost. And I cried because God is healing me from this disease. I cried tears of joy as I realized it truly is not over yet--I can keep on fighting. The tears were cathartic and calmed me down. My anger subsided. I awoke the next morning and I felt relatively good. The herx had run its course and I prayed to God for forgiveness for my anger, apologizing for blaming Him for my illness. The purpose of this long-winded, rambling and at times random blog post was to share this song with you. Give it a listen. And, when you are herxing and emotionally hurting, listen again. Have faith, for it is not over yet. "Oh, to everyone who's hit their limit, it's not over yet, it's not over yet, and even when you think you're finished, it's not over yet, it's not over yet. Keep on fighting, out of the dark and into the light (it's not over), hope is rising, never give in, never give up, it's not over yet"
And for those who were wondering...the game was incredible. I was able to watch Bama throw it down the field in HD from my couch like the team never has in my lifetime. It was an exciting game, both teams played really well, and we walked away with an impressive win. Although it has been years since I've been well enough to attend a game, I look forward to potentially going to one later this season. I am staying positive and know that with God's help I will continue to get well and will one day step back into Bryant-Denny stadium knowing that for me, it will be a huge win, regardless of the outcome of the game. And...I might even feel a little normal. Sorry for all the IT issues. I'm not sure why the videos do not show up on mobile devices (it just shows up as a huge blank space), so I have just put the links on there. Also, to avoid any confusion, my pity party was based on a lifetime of having lyme disease and the effects of a herxheimer reaction, not simply missing a football game. I focused so much on the game to show how, when you have Lyme, sometimes being able to go or do the simplest things are HUGE. I hope that you love the song and find it helpful, no matter what battle you are fighting.